Glenn McCormick and Martin Barr were both top ten finishers at the recent Maxxis British MX2 at Lyng. Ballyclare’s Martin Barr brought his Crescent Yamaha home for sixth overall in the Maxxis British MX2 class round two at Lyng. After qualifying third the local rider finished fifth in race one followed by sixth in race two. “It was a frustrating day that should have been better,” said Barr. 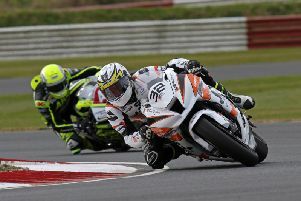 “It all started well with 3rd in qualifying but I made not such a good start in race one and got stuck behind traffic. By the time I got through to fifth the leaders were away. Glenoe’s Glenn McCormick had a DNF mechanical issue in race one but took the Unique Fit Out Husqvarna to 10th in race two. McCormick was happy saying: “I can’t complain. I’m really only getting my season going and to finish tenth in race two was good considering most of the guys in front of me have been racing GPs and are really on the pace. The bike is flying but unfortunately in race one a small issue forced me out while lying inside the top ten. The class was won by Conrad Mewse on the locally based 250 Hitachi KTM fuelled by Milwaukee. Lisburn’s Gary Moulds and Steve Kirwin celebrated their first world championship points of the season when they scored six points after finishing 15th in race one at Talavera, Spain, round two of the championship. Unfortunately they had to retire from race two after Kirwin suffered a back injury. “It was disappointing not to finish race two as we were in the points at the time,” said a disappointed, Moulds.